Bleeding gums are a telltale sign of gum problems. It’s certainly a sign of gingivitis (inflamed gums) and could even indicate gum disease, which is one of the leading causes of tooth loss. Even teeth that have never had cavities can become loose and fall out if the gums and underlying bone aren’t there to support them. Dry mouth is a common side effect of many prescription medications. Not only is it uncomfortable, it also greatly increases the risk of getting cavities. Saliva washes away plaque and food debris, and neutralizes the acids in the mouth that cause decay. When a patient has dry mouth, the protective benefits of saliva are lost. Persistent bad breath that doesn’t go away can indicate that you’re overdue for a cleaning or that you have gum disease. In either case, there’s odor-causing bacteria in your mouth that must be removed professionally. Even with good brushing and flossing, you simply can’t remove it at home! 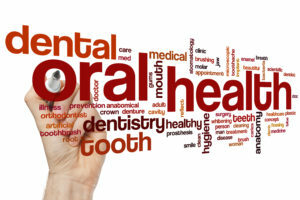 Get regular dental care – Regular checkups with a Mansfield dentist are crucial for good oral health. Your teeth and gums will be closely monitored twice a year and you’ll get recommendations and treatments tailored for your specific needs. Establish good hygiene – Simply brushing twice a day and flossing once will minimize the amount of dental work you need over the long-term. Also, don’t hesitate to ask your dentist at your next checkup for tips, tricks and tools that can help you with your hygiene routine. Reduce sugars – You don’t have to give up sugar entirely, but minimizing it will go a long way towards keeping your teeth healthy. Counteract dry mouth – In addition to drinking a lot of plain water to stay hydrated, using topical fluoride will strengthen your enamel and prevent decay. You can also use one of the dry mouth products from the drugstore that are designed to keep your mouth moist. By keeping an eye out for these 3 signs of poor oral health and taking steps to improve your teeth and gums, you’ll be on well on your way to having a healthy smile for life! Dr. Sandi Hamm is a general, cosmetic and restorative dentist in Mansfield who is passionate about providing her community with outstanding dental care. She gets immense professional satisfaction from caring for her patients’ smiles and contributing to their overall quality of life. If you have any questions, she can be contacted via her website or at (817) 477-4441.